The 2010 World Championship Finals ended with the color gold for Blue. For the second year in a row, the Blue Devils (1st, 98.90) won the gold medal in the World Class, concluding one of the most competitive Drum Corps International seasons in recent history. "I'm not sure how we got there, but I know what made up the organization," said Blue Devils Executive Director David Gibbs. "It's the staff, designers, instructors, and an amazing group of kids who were committed from day one to the end. The talent and commitment of these kids made it happen." The Blue Devils' winning program, "Through a Glass, Darkly" was based on the experimental musical selections of Bob Graettinger's "City of Glass" that was written for Stan Kenton. "We knew it probably wouldn't be the crowd favorite," said Percussion Arranger Scott Johnson. "I don't want to say we didn't care about the crowd, because we always do, but we wanted to try something different. We figured after last year's success we had to do something different, and the performers bought into it." Yet perhaps the defining characteristic of the 2010 season was the exciting competitive action among corps outside of first place. In the weeks leading up to World Championship Finals, the Cavaliers and Bluecoats took second and third, sometimes switching for several nights in a row. During Finals week, the Cavaliers topped Bluecoats in all three shows, and also came closest to upending the Blue Devils at the Semifinals, reducing the margin to .7 on Friday. In the end, the corps took second place scoring 97.75. "We're not disappointed one bit," said Cavaliers Director Adolph DeGrauwe. "We accomplished everything we wanted to do. We wanted to be entertaining, we wanted the crowd to love us, and we wanted the corps to have a great time. They've done that. So second place to us is fine." 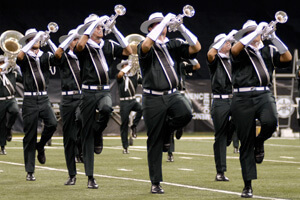 For the Bluecoats (3rd, 96.40), 2010 was the most successful season in the corps' history. 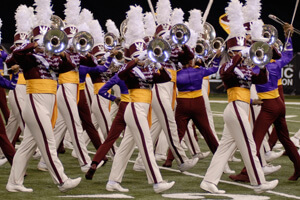 It was the first time for the corps to win a medal, and the ending score was the highest the Bluecoats had ever achieved. "It's been a great, great season for us," said Bluecoats' Executive Director David Glasgow. "We came a long way this season. We made a lot of progress to be in the top three, and to be a medalist is a very exciting thing." Carolina Crown (4th, 95.95) finished the season .6 higher than Friday's Semifinals event. "This last week was a lot of fun, capping off a difficult season," said snare drummer Evan Worrell, who took over the center position after the original member left the snare line due to injury. "I think coming off of second place last year, everyone wanted to get back in the swing of it. Obviously the goal is to do as best you can, and if at the end of the season it's a Championship, or a medal, or whatever, we're happy to have a great show to end the year and put something special together." For the second year in a row, Carolina Crown won the DCI Fan Network Fan Favorite Award. The Cadets held onto their position in fifth place with a score of 95.10. "We definitely had a great run to finish up the season," said assistant director Justin Heimbecker. "It's definitely difficult to put together three excellent runs that get better and better each night. But I think we definitely did that, and it was a good way to cap off a long, challenging and exciting season." "When you first see the crowd it's a surreal moment," said third-year Cadets trumpet and age-out Scott Proctor. "It's such a large crowd. This year's show is such an interactive show with the crowd – so it makes it that much more special, that crowd connection. You can kind of feed off their energy. It helped grow the show to so much more." Consequently, it's Proctor's favorite from the years he's marched. "When I first came to the Cadets, I was really nervous, but now that I've been here – it's such a family atmosphere. And some of the friends I've made are some of my best friends I may ever have in my entire life. I am so grateful for all the opportunities that I've been given here." Only one corps kept the Blue Devils from sweeping all captions: Phantom Regiment. Finishing in 6th place with a score of 93.15, the corps took first in Percussion, earning them the Sanford Percussion trophy. "I really think it's the attitude," said Drum Major Jonathan Cao about the battery percussion and front ensemble. "They all come every day ready to work regardless of what circumstances are out there. They're really hard workers, and as [percussion caption head] Paul Rennick would say, 'They're jamming.'" 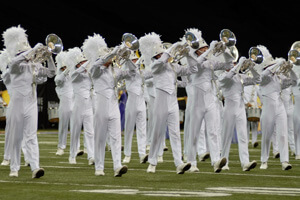 Phantom Regiment improved significantly from its 9th place position in 2009. Shortly after the corps hired drill designer Myron Rosander, he came up with the idea of "Into the Light. "For me, it's a deeply personal show just because of what I've gone through in recent years with my health. The fact that I'm even here is a miracle. So all of that had been bubbling around for a long time, and in my mind, it became a show." It was a breakneck race between Santa Clara Vanguard (7th, 92.00) and Blue Stars (8th, 91.90) during the last weeks of the season. If the Blue Stars had come out on top, it would have been their first time placing higher than 8th since the corps returned to the World Class in 2006. The Vanguard held on to 7th place, however, winning by a tenth of a point. "The progression of the members has been quite a journey," said color guard rifle technician Pepe Ochoa. "Starting from the beginning of pre-tour learning the show to making changes as the weeks go on, the kids are constantly learning new things, applying new techniques, and always working hard. It certainly paid off this season." 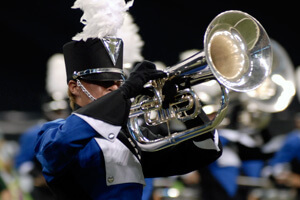 "Finis Coronat Opus," the Blue Stars' motto which translates to 'the end crowns the work,' also summed up the 2010 season for horn line member Morgan Passino. "It's been a constant progression of upward achievement. Every rehearsal day we've been pushing to get where we are right now. At the end of the day it goes back to that: FCO. We put in a lot of work but it's going to be paid off, and here we are, Lucas Oil Stadium." "I think the crowd loved us; they were electric," said Visual Caption Head Chris De Leon. "Every time I turned to someone, they said it was one of their favorite shows of the year. I was on the field [for Finals] and it was amazing to see them up close going after every single detail, performing their hearts out." It was a milestone season for the Boston Crusaders (9th, 89.35), who celebrated their 70th anniversary in 2010. "We just wrote the entry for our 70th year, and talked about the 69 years of Crusaders before us who paved the way for what we came here to do tonight," said Executive Director Tom Spataro. "And it's an unparalleled feeling when the corps can reach its peak on the last night of the season. There's a sense of greatness, and joy, and sorrow at the same time – I can see it on their faces. It was a terrific night for them and a great way to close the book on the 70th year." 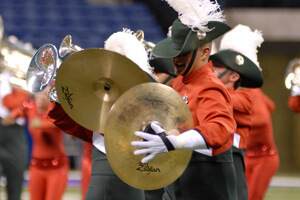 Roaring back into the Top 12 for 2010, the Madison Scouts (10th, 88.95) achieved their highest score and placement since 2006, returning to their roots with the classic "Slaughter on 10th Avenue" and "Rhapsody in Blue." The corps was introduced on Finals night by its original name, the Madison Explorer Scouts, with members in white neckerchiefs in the fashion of the 1938 corps. "One thing I'm really proud of is how they approached the season," said Artistic Director James Mason. "They were a 15th place drum and bugle corps last year. So consequently, they had to work extremely hard to bring the brand back. And I am very proud of their effort." 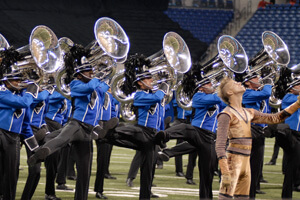 Though the Blue Knights (11th, 87.10) finished in the same spot in the standings as last summer, members performed a show that drew a vigorous response from the vast crowd of Lucas Oil Stadium, and their show has been exciting audiences all season. "On our first tour in California I spent more time watching the audience than I did the corps," said Staff Coordinator Jason Buckingham, who has been with the corps since the early 1990s. "It was so fun for me as a longtime staff member around here to see the crowd react to the Blue Knights the way they did this year because that hasn't always been the case." "It's just been a dogfight out there. It could be that performing in this Saturday night show this year is more special than some other years because there are so many great corps. Not just in the Top 12, but the whole World Class has really elevated their game this year," said Buckingham. The Glassmen (12th, 85.80) concluded this year's Top 12 World Class corps performing in the Finals Saturday night. "I've been in the corps two years, two great years, and I've had a lot of fun," said drum line member Austin Jabaut. "The great thing about this corps…is that it's not all just worrying about beats and everything like that, but it's also about learning to be a better person. I have to go out in the real world now since I'm aging out, but I know I'm going to be ready for anything." View scores from this event. Contributing to this report: Ryan Cain, Amy Fallon, Jeff Hartowicz, Christina Mavroudis, Chris Weber.